NEW! The Jobchart System® Version 2! Note that the evaluation version is limited to 5 jobs and does not have the ability to print. Find Jobchart System® (it might be "The Jobchart System®") and remove it before continuing with your installation. If you are upgrading from version 1 of the Jobchart System® Software, simply install the new software and then use the Convert... feature to upgrade your database. Once you have setup the version 2 software, you can uninstall the version 1 package. If you are running Windows XP or Windows 2000, make sure you are logged in with Adminstrator privileges or the installation may not work. Contact your local technical support personnel for help with this if necessary. You cannot use the software without these items. Download the installation file (~45 MB). 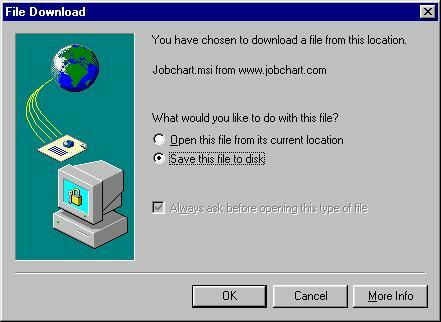 A pop-up window will appear (similar to the one shown below, depending on your operating system); select Save or Save this file to disk option and click OK. Save the file to your Desktop, or somewhere else you will easily be able to find it. NOTE: If you see a window warning about suspicious or malicious code, ignore the message and continue as instructed above. When the download is finished, run the install file and follow the directions to setup the software. If you are intending to use the database with multiple users over a network, copy your security and database files to that location (for example, N:\Shared\), otherwise you can copy these files to your local Jobchart System® folder (usually C:\Program Files\Jobchart, unless you changed this option during the installation process). NOTE: If you are sharing the database over a network, you should contact your network administrator to create a suitable network folder to hold the database that is protected from unauthorized users. Run the Jobchart System® Software, and enter your organization name and license key at the prompts. Login to the security engine with the username manager and no password. You're in! NOTE: The first thing you should do is to change your password! INSTALL the newest UPDATES (available below) immediately! This will ensure that if you experience a software issue, it hasn't already been resolved by a recent version. If you have any problems, contact Technical Support. 2007-12-20: NEW UPDATE! Version 2.0.53 is now available! Uninstall your current software version. Then proceed with the download and installation of the patch.